Droplet by Sinevibes is a Virtual Effect Audio Plugin. It functions as an Audio Units Plugin. Droplet is a plugin for modeling "raindrop delay" effects. It is based on a chain of 24 randomized delay lines, specially configured to produce a sound similar to drops of rain or small particles falling onto a surface. This delay chain features variable frequency damping, time modulation with original phase-flipped routing, as well as chaotic stereo panning, all of which lets Droplet go much beyond the actual raindrop delay – and into granular clouds, dreamy spaces and lush chorused reverbs. Since the parameters are randomized each time a Droplet instance is created, just as any natural process it will never sound exactly the same - even the same preset on two different tracks in the same project will sound different. Chain of feedback delay lines with 24 "drops" and high-quality spline interpolation. Corrosion : a very good distortion, i love to use the hard clip with extreme settings to simulate on overload.It can be subtle or very aggressive. no scams, no placebo knobs, THE sound is here to crush yours tracks ! Dipole : Dipole is a through-zero flanger effect ...everything is said. sound and efficiency are here. No subtle, you have a 'IN YOUR FACE' flanger with character. Dispersion : Dispersion is bouncing ball delay, it is the first time i have a boucing ball delay, the GUI is simple enough to understand the process without manual, i really like the modulation on this one, you can create insane feedback or unusual delay line, I love tho be able to expand the stereo deepness of the processed sound. You can achieve the same thing with other plugin like BC Late, Echoboy.... but Dispersion is just simpler to use.The sound is great. 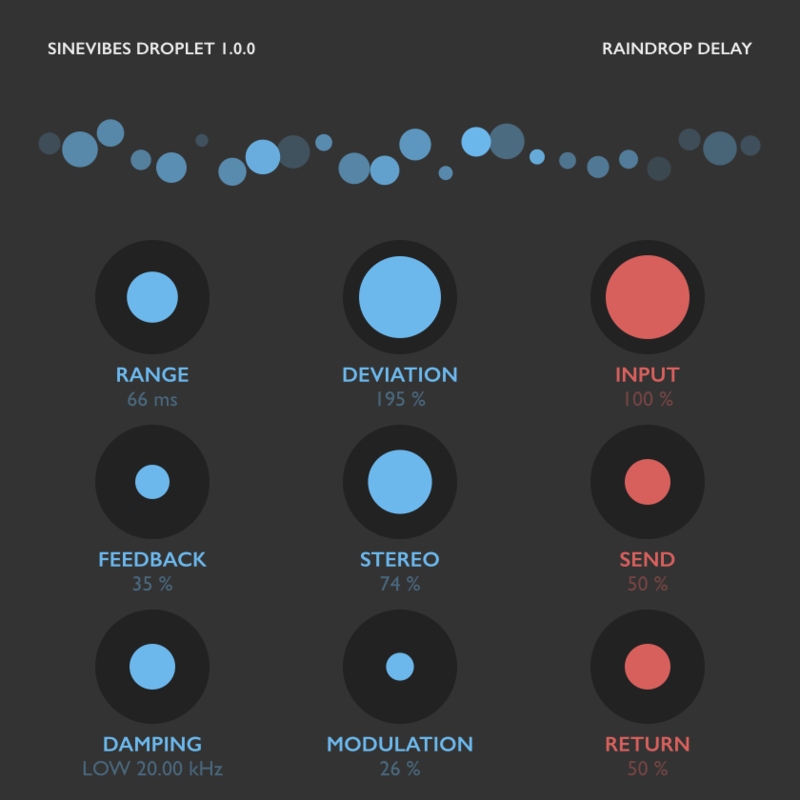 Droplet : Droplet is a plugin for modeling "raindrop delay" effects. Here we are ! I think droplet is the best plugins from Sinevibes, droplet is simple to use, it generate a rain of little sound drop, amazing ! wonderfull ! You can obtain something subtle or something more present. The blue spot on the top of the plugin, is, I think, the best way to describe the plugins, imagine a little rain while the the sun is rising, each drop reflecting the light....This is maybe my favorite plugin since a long long time. Emission : Emission is a special processor for creating unreal, out-of-this-world space effects. Here we go again ! A killer plugin ! an unique reverb, i 've never try a plugin who make me feel that i 'm playing with modular fx hardware like this one ! this reverb have a character and each parameters are audible on the sound when you tweak it.My new favorite reverb. Eternal : Eternal is a barber-pole flanger effect. A different flanger, the interface is easy to understand, each parameter have a direct impact on the sound. It sound good, i love the fact I can expand the stereo.Easy to use and efficient. Malfunction : Malfunction is a "circuit-bent" filter - a filter with intentionally broken connections and erroneous math that produces very special, hissy and screaming distortion. + : The GUI and the sound make me feel like i play with hardware modular fx unit. - : The bad point is there is no VST version and windows version, to use these plugins with cubase i use Blue Cat Axiom. I'd really like Sinevibes make a rack when we would be able to use and modulate each parameters of the desired FX. 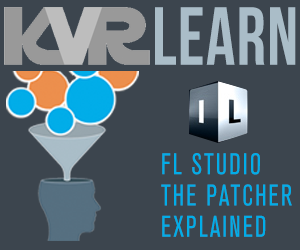 The only thing who come to my mind about these plugins is : " WOW ! " You can download the demo on their website to try by yourself.